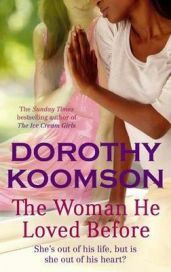 Ever since I read my first Dorothy Koomson book, I have been hooked on this fabulous author. All of her novels are absorbing and thought provoking and examine human relationships so well. I have noticed though, that the content of her later stories are getting slightly darker than her earlier ones. This is certainly the case with ‘The Woman He Loved Before’ which is her latest book which was gripping from the very first page but did not turn out to be quite the read I was expecting. Libby is the main storyteller in this book and she is married to Jack. However, Jack was previously married to Eve who died tragically after falling down the stairs. However much Libby feels that Jack loves her, she can’t help feeling that he still loves Eve more and that does not lead to a happy marriage. Her fears are realised most poignantly when, after a severe car accident, she hears Jack calling for Eve rather than for her. Faced with appalling injuries and afraid to venture out in any car, Libby is trapped in the house which is also the home that Jack shared with Eve. Although she feels that the marriage is over, she sets about finding out as much as she can about this woman that he loved before, and after stumbling across Eve’s diaries, she is appalled at what she finds out. It is at this point that ‘The Woman He Loved Before’ takes on a far more sinister tone and changes from being just a light and entertaining read. We get to read Eve’s diaries along with Libby and what is revealed is totally startling and heartbreaking. Eve has definitely not led the charmed life that one might have expected and Libby starts to feel quite disturbed by what she has found out. Will the diaries help her make sense of her life with Jack and is there possibly a chance that she can help make amends for how Eve suffered? These were the questions that filled my mind as I was compelled to keep on reading this fabulous book. Both Libby and Eve are fascinating characters. One can’t help but sympathise with Libby’s situation, particularly trying to compete with a dead woman for her husband’s love. As much of the novel is written in the first person from her perspective I felt that, as a reader, I got to know and like her very well. Equally, learning about Eve through her diaries was equally revealing as that is also written in the first person. I felt quite shocked by some of her revelations but also felt that I really came to appreciate her complex character. A few chapters are told from Jack’s point of view and to be honest, it is difficult to know what to make of him for much of the book. Dorothy Koomson cleverly raises lots of questions in the reader’s mind about him and throughout the book my opinion swayed from thinking he was callous and uncaring to loving and warm and about every other personality trait in between! As you can probably tell I loved this book. I just had to keep reading on to find the answers to my questions but equally I did not want it to finish. There are so many words to describe this book – gripping, poignant, shocking, heart warming – but most of ‘The Woman He Loved Before’ is a book that you just won’t want to put down! No Comments on "The Woman He Loved Before"